Earlier this year, the world's largest blackout – The Great Indian Outage, stretching from New Delhi to Kolkata – occurred. The blackout, caused by a northern power grid failure, left nearly 700 million people – twice the population of the US – without electricity. In Part 1: Earlier this year India suffered a huge blackout – leaving 700 million people with no access to power. 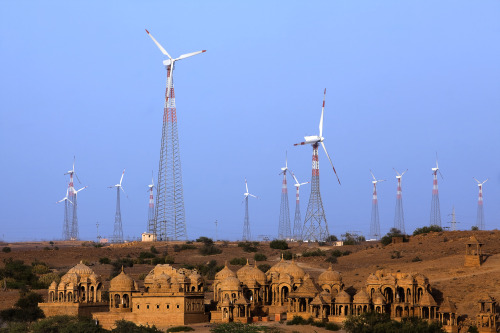 Could this be one more example of why renewable energy's time has come in India? Accelerate local demand for renewable energy by providing preferential Feed-in-Tariffs (FIT) and other incentives such as accelerated depreciation; tax holidays; renewable energy funds; initiatives for international partnerships/collaboration incentives for new technologies; human resources development; zero import duty on capital equipment and raw materials; excise duty exemption; and low interest rate loans. Develop large scale solar manufacturing in India (transforming India into a global solar manufacturing hub). Promote and establish utility scale solar generation parks and farms. Also, establish R&D facilities within academia, research institutions, industry, Government and civil society to guide technology development. Work towards a Hydrogen Economy development plan. Hydrogen can be fed into fuel cells for generating heat and electricity – as well as for powering fuel cell vehicles. Produce hydrogen using renewable energy with solar and wind power. If done successfully, hydrogen and electricity will eventually become society's primary energy carriers of the twenty-first century. About: Darshan Goswami has over 35 years of experience in the energy field and is currently working for the United States Department of Energy (DoE) as a Project Manager in Pittsburgh, PA, USA. He previously worked as Chief of Energy Forecasting and Renewable Energy from the United States Department of Agriculture (USDA). The views and opinions expressed in this article are solely those of the writer and are not intended to represent the views or policies of the United States Department of Energy (or Renewable Energy Focus magazine). The article was not prepared as part of the writer's official duties at the United States Department of Energy.